Like the Nigerian anthem says, “the labours of our heroes past shall not be in vain,” is now hurriedly going in vain as this is currently the ugly fate befalling neglected retired civil servants who have spent all their life times serving the country. The tales of the suffering and hardship pensioners in the country are passing through are no longer news. 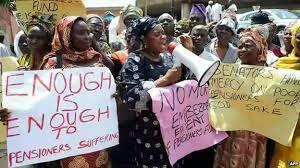 In fact, their complaints, lamentations and predicaments have become common to political leaders that it appears the issue of pensioners no longer irritate them. How else could one explain a situation where years of pension arrears and unpaid gratuities accumulated by successive government have remained unattended to and it does not bother officials of both federal and state governments who go about their businesses as if nothing is going wrong. A large number of retired civil servants die of hunger or out of frustration due to delays in the payment of their retirement benefits in recent times. Some of them of whom are mainly septuagenarians and octogenarians, are faced with serious challenges of inability to meet up their family and social obligations. Nigeria has now become a graveyard for pensioners with little or no care for our elderly persons. This ugly development has jeopardized the future of many families as either their children or wards are dropping out of school or dying of common ailments because of lack of money to pay their bills. Life after service without money can be very difficult and frustrating. No wonder in today’s Nigeria, the slogan for public servants is “secure your future and have a good retirement life.” The passion for public service has long been forgotten in the dustbin as youths no longer take delight in working for government because of what they see pensioners go through. Those still jostling for civil service or government work are doing so out of desperation. It is therefore, time for government at all levels in Nigeria arose to the task of caring for the needs of pensioners or the senior citizens in the country and save them and their dependants from unnecessary sufferings. In Delta State, retired civil servants under the auspices of Nigeria Union of Pensioners, NUP, staged a protest during the last Pensioner’s Day celebration appealing to the Governor Ifeanyi Okowa-led administration to pay them their pension arrears and gratuities. Okowa wants to kill pensioners,” “Okowa honour your fathers and mothers if you want your days to be long,” “Stop treating pensioners as second class citizens,” “Pension is a right not a privilege,” among others. They lamented that a large number of their members were living from hand to mouth while some others were dying of either starvation or sicknesses. Chairman of the NUP in the state, Mr Robert Chukwunyem who spoke during the protest, said they were being owed three months pensions and gratuities. Similarly, in Cross River State, pensioners who retired from the state civil service, protested non-payment of four years arrears and gratuities from 2012 to 2016. The protesters carried different placards with various inscriptions like, “Gratuity is our right, not a privilege,” “Give us our right while we are alive,” “Our children and wards are out of schools,” etc. One of the Coordinators of the retirees, Mr. Paul Idagu said that life has not been easy for four years after his retirement from service. “I find it very difficult to pay my children’s school fees and other relatives who are depending on me. In Rivers State, while some pensioners are owed for more than six months due to the biometric exercise which the State government insists was necessary to curb leakages, some retirees are owed 8 months pension arrears. In Edo State, pensioners have, at several occasions, staged protests against the government over non-payment of their pension arrears. They recently protested against the non-payment of over 42 months of pension arrears and gratuities. The pensioners lamented their plight and alleged abandonment after serving the state meritoriously in various capacities. They complained that most of them who retired from public service in the state between 2013 and 2016, were yet to be paid their pensions and gratuities. In Akwa Ibom, the pitiful plight of pensioners appears to be worsening by the day as hard times stares them in the face. This is owing to delays and irregular payments of their pensions. Investigations carried out revealed that the government owes pensioners at local government councils four months arrears. Their counterparts at the state level’s woes varies, with some claiming that their last pension was paid sometime in 2015 while others claimed to have received their last pension late 2016. Bayelsa State is no much better as pensioners were being owed about 9 months from October last year till date before they were paid one month for those at state level and then 2 months for those at local government level. Already, about two pensioners have died while three slumped during the payment process. So many of them must have died because they were in dire need, in addition to the present economic situation of the country. Despite the recent mass action by pensioners in Imo State under the aegis of the Nigeria Union of Pensioners, NUP, not much seems to have changed. The aggrieved Imo state pensioners protested against the inability of the government to clear their accumulated arrears and gratuities while barricading major roads around the city, making vehicular movement difficult. They faulted the State government’s alleged directive that they forfeit 60 percent of their accumulated pensions and gratuities. The Chairman of NUP in the state, Chief Gideon Ezeji, during the protest march in the capital city of Owerri said pensioners in the state have never experienced the level of brinkmanship, abandonment and hardship they are facing under the Governor Rochas Okorocha-led administration. As at May 2016, civil pensioners in Imo state are owed 13-16 months. LG pensioners; 14-17 months, retired primary school teachers; 23-26 months, Imo Broadcasting Corporation pensioners; 36 months and Alvan Ikoku College of Education pensioners; 68-71 months. The Union leader said efforts to compel the government to treat the matter with the urgency it deserved fell on deaf ears. The pensioners in Abia State have not fared better. Apart from the arrears of pensions from January to July 2016, pension arrears of 2014 and 2015, which ranges from 4 to 10 months are still outstanding. While civil servants in Benue state continue to groan over non-payment of their 4 to 6 months salary arrears, pensioners are being owed close to two years. Investigations shows that the last time pensioners in the state were paid was in 2014 and since then, efforts to offset their backlog of pensions had, at various times, hit the rocks.